It’s very easy for personal trainers to over-complicate things for clients, spending (and often billing!) hours writing incredibly detailed programmes which on the surface may seem like they address your goals, but often leave fundamentals such as mobility or the different energy systems untouched. There aren’t many of us who need to have programmes as complicated as an elite athletes’, despite what we’re told by fitness professionals. While private 1-on-1 personal training definitely has its place, semi-private and small group training have enormous benefits which shouldn’t be overlooked. Let’s have a look at a few of these benefits now. As we all know, the frequency and consistency of our training sessions over time will play the biggest part in our success when it comes to achieving a health and fitness goal. Whether you’re working on body shape or simply an improvement in your overall health, frequency and consistency will be king. Through years of coaching clients, we’ve found that those who manage to be active three times per week or more are the most likely to achieve their results, and then maintain them. If you’re advanced in the gym or a very self-motivated person, then you may well be fine training three times per week on your own. But if you’re new to training, unsure about how to structure a programme for your results, or someone who struggles with motivation then it can be tricky. If you rely solely on 1-on-1 PT and look at training three times per week or more, your session costs are going to rack up pretty quickly! At Hall Training, our system is specifically designed to give you access to different session types and make regular personal training affordable, while ensuring everything is still tailored towards your specific goals. Theoretically, training 1-on-1 should mean you’re working as hard as possible in a session. In practice this isn’t always the case. Despite a trainers’ best intentions, it can be easy to spend a good part of a session catching up about a weekend, and sometimes our clients have admitted to chatting as a stalling tactic if things are getting tough! Don’t think we didn’t notice… With 1-on-1 training you need to turn up to every session prepared to push yourself against who you were last session, and it’s not always easy to get into that mindset. Our semi-private and small group training sessions are where teamwork and camaraderie really come into play. All of our members have told us they work harder when they’re training alongside others. Now this doesn’t mean sessions are competitive, but it means members push themselves to keep up and work hard. As trainers there’s nothing better than seeing your members cheering each other on and providing that extra dose of motivation. There is something really special about training alongside like-minded individuals. One of our mottos is “execution above all else”. As a team, we’re all about performing exercises correctly and we know that watching, understanding and then implementing correct exercise mechanics can be challenging. We’ve found that our members learn so much more quickly when they see those around them, sometimes even in the same session, performing the movements with expert guidance. No more poor form or worrying about doing things badly – you have a whole community of people around you focused on making sure you have the best session ever. The same applies for asking questions. We aim to give our members the tools they need to truly understand what a healthy lifestyle is. Having different perspectives in one session means different questions get asked and answered on the spot, often questions members may not have thought of themselves. A common concern we hear is “but everyone is doing something similar, so I won’t get results.” In the politest possible way, that’s nonsense unless you do happen to be an elite athlete or a bodybuilder. Programmes don’t need to be ridiculously complicated to get results, they just need to address all the fundamentals and be properly periodised over time, which ours are. They also need to be tailored to the person, which ours are. Over ten years of programming for clients, we found that similar methods, philosophies and exercise patterns were yielding the best results for those with the same goals – be that fat loss, hypertrophy, strength or general health. It’s very easy for a personal trainer to write you a “personalised fat loss programme,” but the reality is that programme will have a huge overlap with all of their other fat loss programmes. After all, there are only so many ways to skin a cat. We took training back to the principles we have found to be the most effective and developed a training method that addresses the whole health and fitness package, while allowing room to pursue individual goals. What we have is a framework for every session that addresses the entire fitness package – mobility, activation, strength and cardiovascular fitness. Within that framework we’ll have certain movement patterns and muscle groups to target that are the same across clients, however everything is pushed forward or pulled back depending on your ability and goals. You can check out our infographic for more details! When members start our 30-day trial they often worry about training alongside people with different goals or abilities. The benefit of semi-private and small group personal training as opposed to a class or boot camp is that we are still able to tailor everything 100% to you. 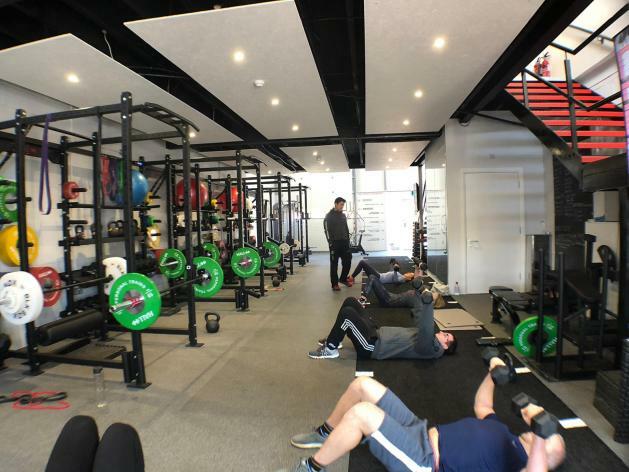 This is where Hall Personal Training is different to your local small group training or park fitness session – you won’t see four people in a line doing identical things; don’t worry about where you’re starting out from! We have members aged from 16 to 85, looking to do everything from get shredded to a holiday to an ultra-marathon to be better at climbing the stairs. Our members catch up over coffee before their session if they’ve got time, they congratulate each other or help each other up the stairs after a session if they need to. They arrange 5k runs, or theatre nights, or help us with our charity fundraising and social events. They have all found somebody with a similar goal to work alongside. The biggest benefit of training with others is you’re never alone. Hopefully this blog post has shed some light on why we’re looking at these different types of training now. Although they may not be the method you’ve been led to believe is the most effective, we can assure you it’ll cover all the bases. If you’re keen to give it a go, or want to challenge us to convince you, why not take out our 30-day trail and put us to the test? As always if you have any questions, you can drop us an email. Reach me on george@hall-training.com.